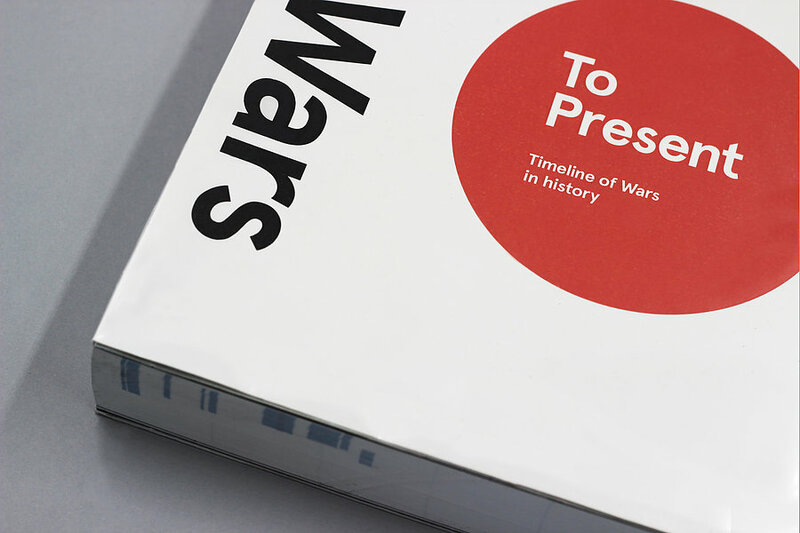 It's tremendously inspiring to see what designers and fellow artists can do with the data from the List of Wars. 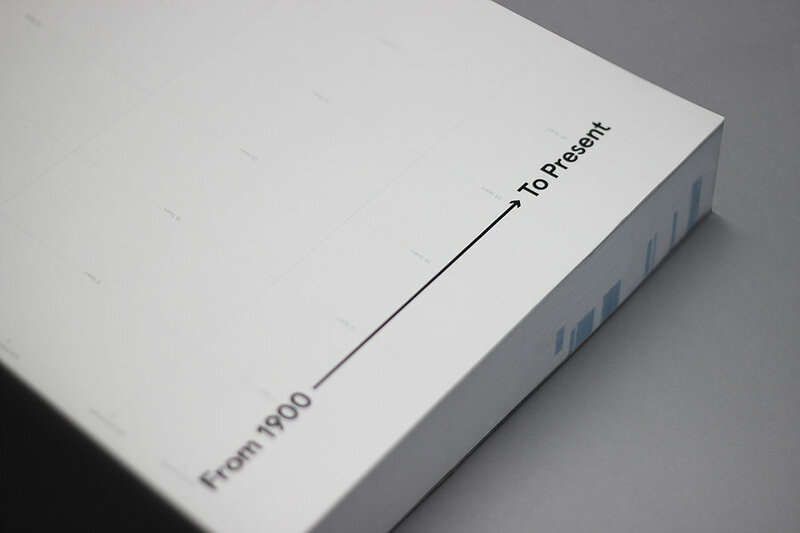 One stunning example is the innovative book project "Timeline of Wars in History" by graphic designer Minryung Son, whose intricate use of pages, edges and laser cut holes to mark time periods and fatality magnitude of each war turns the fundamental structure of the book into a thinly layered, sculptural timeline. 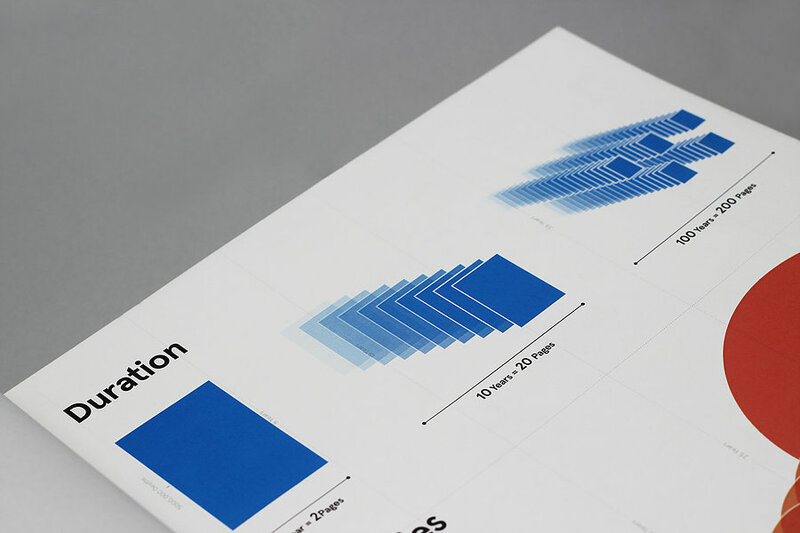 It's a statistical diagram, indeed, but one that is impossible to view in its full extent and that only reveal itself when the book is opened and pages flicked through. 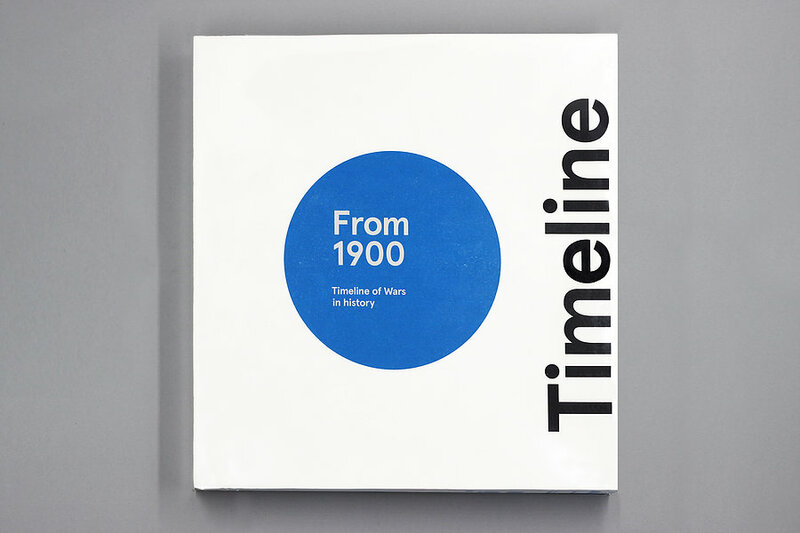 "Timeline of Wars in History is a laser cut book that shows a list of all wars in the history from 1900 to present. 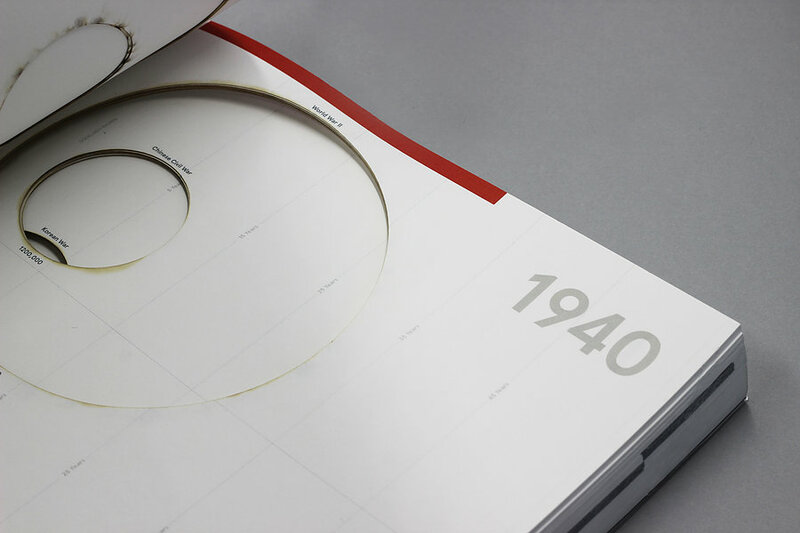 The book highlights the informations about the durations and fatalities of wars by using laser cut circle. 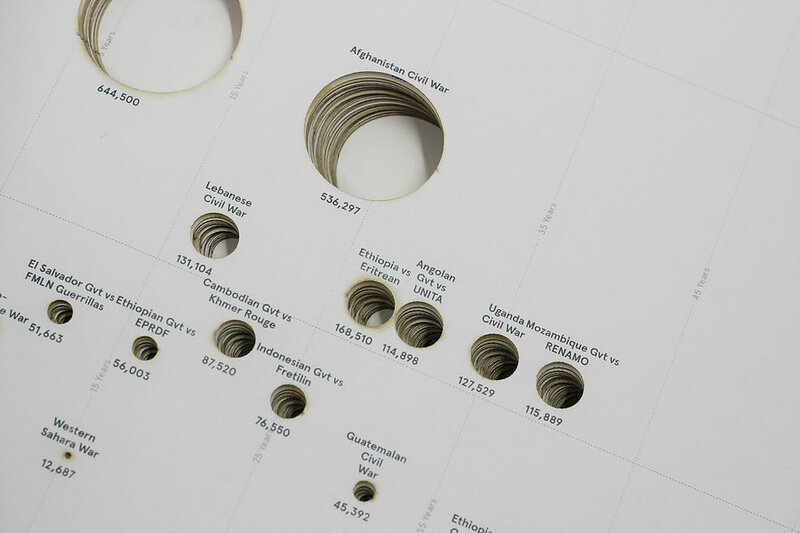 In order to highlights those in an effective way, size of laser cut circles are shown in the book as deaths of wars and depth of laser cut circles are shown as length of wars. Because two pages mean one year, the thickness of book also represents time in a physical sense. Additionally, utilizing the wide space of three edges on this book, Top edge of the book shows the 10 most deadliest wars, Fore edge of the book represents Decade and Bottom edge of the books demonstrates the 10 most longest wars. 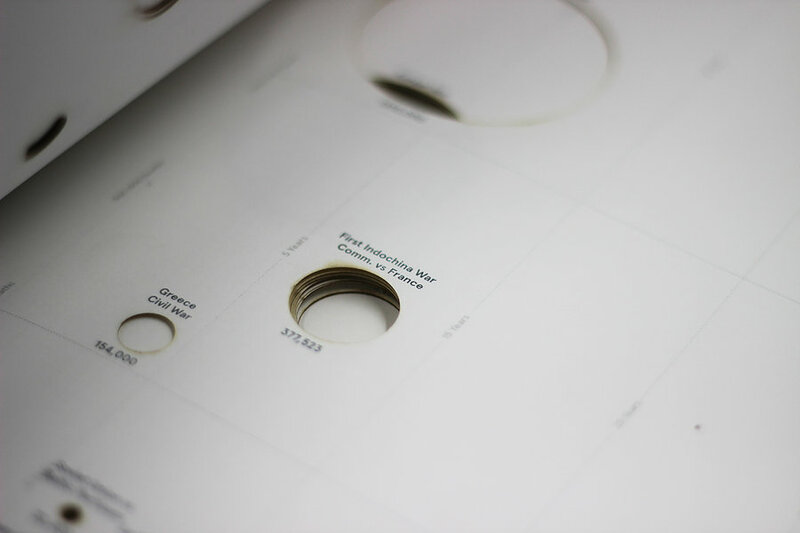 The book eventually visualizes content using various parts of book structure. Because of those complexities in this book, the book has an introduction page to explain how to read this informatic language. 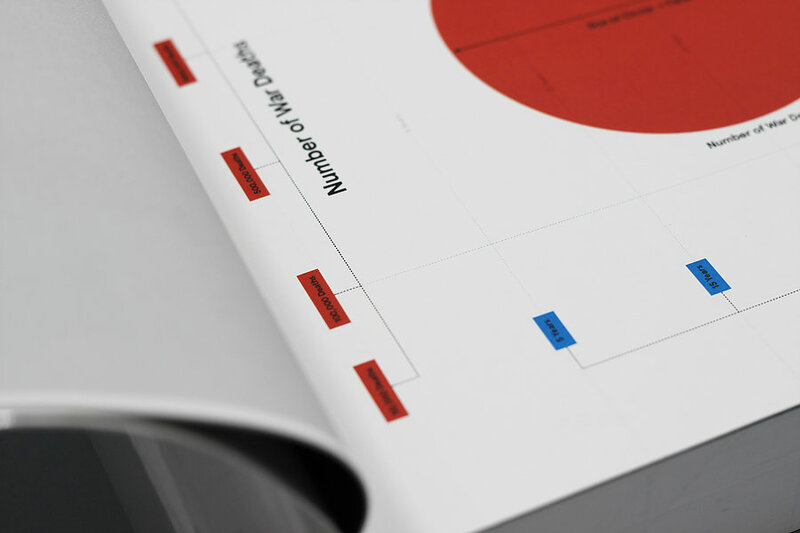 These days a book is more than a tool to show good typography to tell the story. In this project, transforming the traditional medium of a book into a sculpture of content leads the reader to see and understand the content in a new way. Through this way, this book shows an activist approach to raise people’s awareness that how severe the war were in our history and these epic wars are still happening today that we easily forget." All images and the quote are Copyright of Minryung Son and have been published here with her kind permission. You'll find more, and larger images of the book on Minryung Son's website and many other of her exciting projects. Another project that you should take a look at, which also uses data from the List of Wars is Valentina d'Fillippo's online datavizualisation "The Poppy Field" made in 2014, in time for the centennial of the outbreak of World War I. 2016-08-23 | Mobile-friendly website in the making!